Wassilie Berlin showing how a man's bow should measure one arm span. Ngelqaqsugngaluki ellaita tamakut nakmiin pikateng. 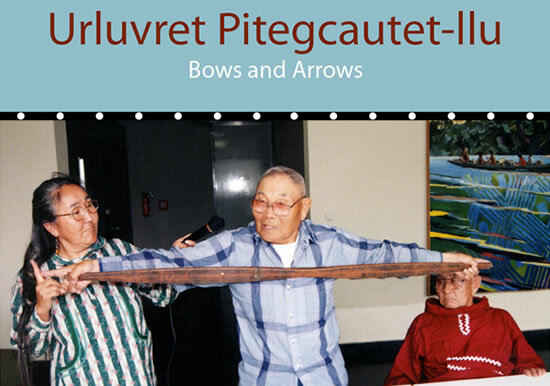 Ngelqerramikun tamana caliaqerkauluku tuaten ayuqellria artuqminek yuk pikuni pisciigatarkaungan. Cali-llu mikelkessiyaakminek pikuni asmarciarkaungami pakikuniu. Taumek tauna aturluku ngelqerteng pilitulliinilriit. Ayuqluku tua-i elliin pikaqluku urluveq taum yuan. Bows were made to fit their owners. If they made the bow too long for the owner he wouldn't be able to use it. And if a bow was too small for the owner, it could break easily when drawn. Bows were made to fit the body and strength of the owner. 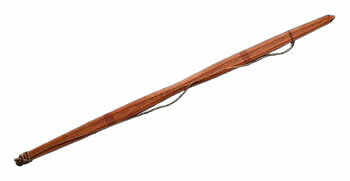 Sinew-backed bow used to hunt large animals and during bow and arrow warfare. Henry Alikayak stated, "Braided sinew makes the arrow travel with more speed and with a powerful impact." 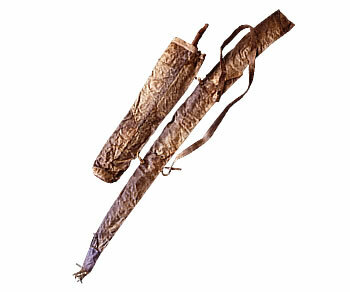 Quiver and bow case made of fish skin, with spine carved in the shape of a bear. Such cases were essential to keep a man's weapons dry and ready for use. 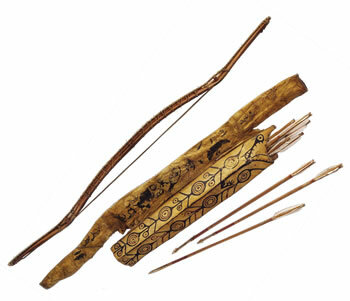 Arrows from the Yukon, including akitnaq (blunt tipped bird hunting arrow), urugnaq (arrow with barbed ivory point), pingayupegcetaaq (three pronged arrow), akulmiqurcetaaq (two pronged bird arrow), and umilek (arrow with a stone point). Peter John recalled: "We caught little birds first because they were tame, and also mice, and they are really good to eat. When we had a bow it was like a gun to us." 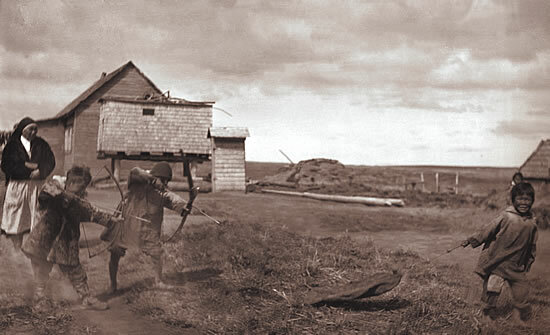 Boys practicing with bows and arrows, Hooper Bay. Theresa Moses said: "I always used to shoot arrows. Those small, blunt-tipped bird arrows with wooden tips would glide over the water when shot. It was fun to walk in shallow water and shoot arrows, especially when hatchlings started to swim." Sinew-backed bow and ivory-tipped arrows with sealskin case. The painting on the quiver represents a paalraayak, an extraordinary creature said to live in marshes, with its mouth open to receive the arrows. Cellulose fibers and wood are built of "hard" cellulose crystals (microfibrils) that are embedded in a soft matrix of cells. These cellulose crystals lie parallel to each other and build a helix that spirals around the fiber or wood cell. Heat causes the connections between the cellulose crystals in wood to weaken, thus deforming the wood. If the wood is kept cool, it will retain its shape and flexibility.